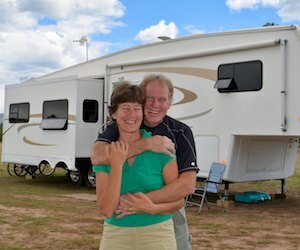 February, 2014 – We were really enjoying the waterways in Phoenix, Arizona, and we soaked in the ebb and flow of river life and all the daily patterns that surrounded it. 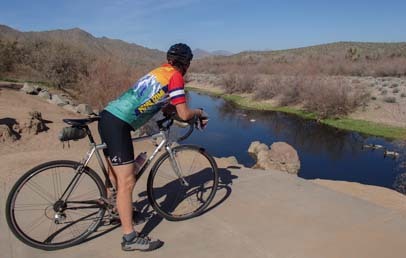 The rivers in Phoenix can be reached from many different access points, and we rode our bikes parallel to the Salt River, ducking in towards the shore at various spots to get a glimpse of the river. We hiked and scrambled along the edge of the water too, marveling at the bright reds and greens of the algae, the surprising presence of all kinds of sea shells, and the thick, jungly nature of the scrubby vegetation that grew alongside. 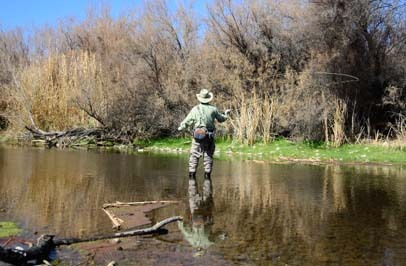 One morning we came across a fly fisherman, and we were mesmerized by the flowing and rippling action of his rod as he stood knee deep mid-stream. He didn’t seem to catch anything, but the fun seemed to be more in the casting than the catching anyways, so it didn’t seem to matter too much. Other animals and birds stood in the water up to their knees and were fishing too. We spotted a lot of different kinds of birds, and we heard that there were even beaver here. We were really surprised when we smelled a skunk a few times too. I’d lived in Phoenix for a long time and wasn’t even aware that skunks can make a living here in the desert. They seem like so much more of a woods animal than a desert one. The river was at a standstill in a lot of places, giving off perfect reflections of the trees above. In other places, though, it rushed along at a good clip. One morning we watched three ducks taking a fast joy-ride down the river. They slipped through some mini-rapids lickety split, and you could almost see the grins on their faces and hear them quack, “Wheeee!” as they effortlessly zoomed past at full speed. 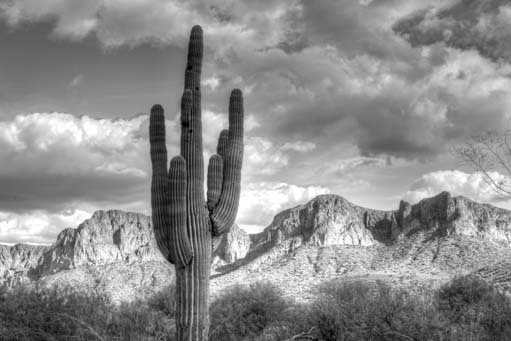 In between the waterways, the saguaro cactus stood guard in armies that seemed to have been positioned with an almost military precision. 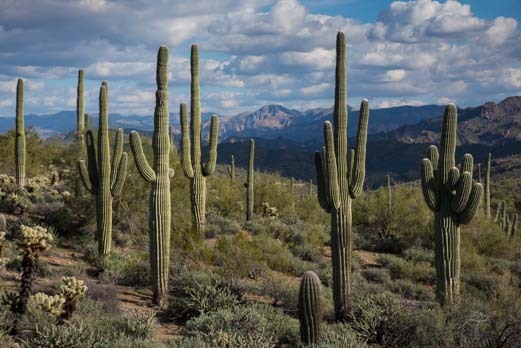 Saguaro cactus aren’t really loners at heart; they prefer to gather in groups. 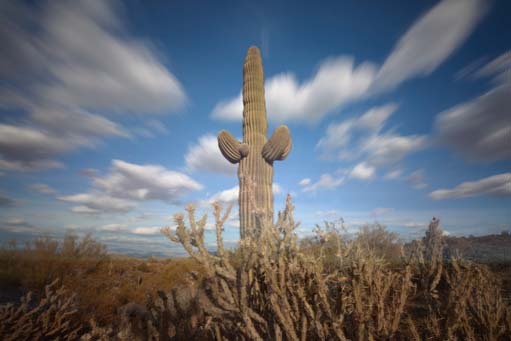 However, each cactus likes to have a bit of space around it. They’ll stake out a claim across a valley or down a hillside, and stand at attention as if waiting for someone to issue a battle cry. Or maybe they’re just cheering together in a standing ovation for some performer that just wowed them on the stage of the opposite hillside! We love these desert people and have ridden our bikes past them on these roads so many times over the years. 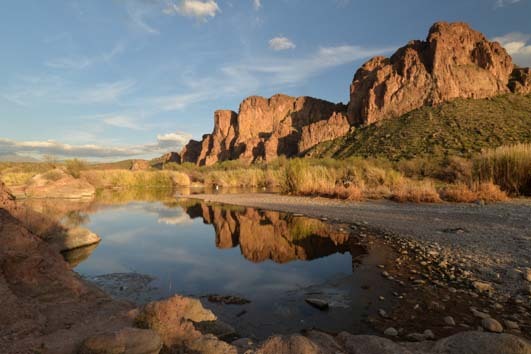 Yet, little did we know — as we snuck through a fence into the open desert one day — that just a quarter mile in from the highway the Salt River flows full and strong. 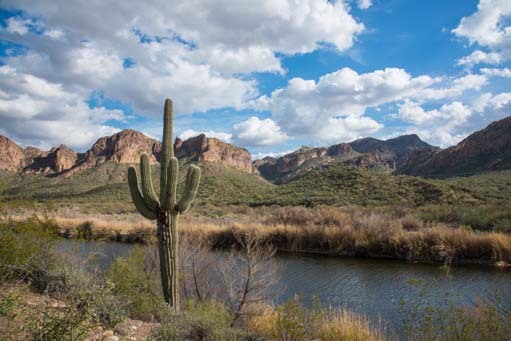 I was hunting down the ideal saguaro cactus to photograph, staggering through the desert, tripod over my shoulder and eyes fixed on the horizon as I tried to line a cactus up with the mountains behind it, when I just about walked into the river. 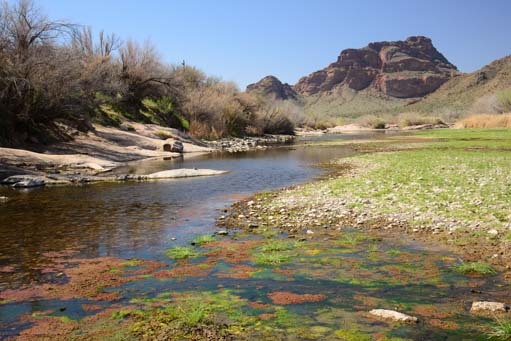 There it was: water flowing, ducks paddling, and saguaros right down to the river’s edge. It had never occurred to me that the roads here are cut at such odd angles because they run parallel to the waterways. And I sure didn’t know as I drove and rode my bike along these roads for all those years that a river was just out of sight to one side. 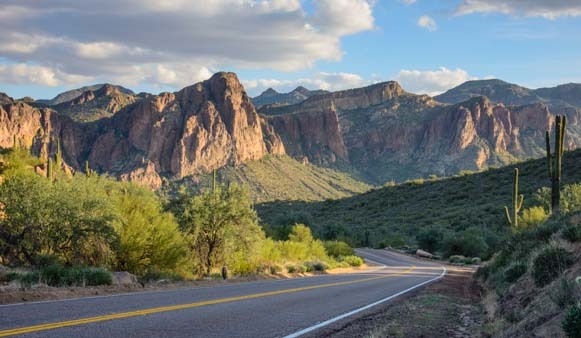 Whether by bike or car, the road from Fountain Hills to Saguaro Lake is one of the most scenic drives around Phoenix. We kept finding ourselves taking detours to include this drive in our route, even when it sent us a bit out of our way. The road winds and curves and soars up and down, making its way between thick groves of cactus and casually stacked boulders, while a view of some rock cliffs in the distance slowly takes shape ahead. After the road dips for a final dive down a steep descent — making you feel like you are being thrown into the open embrace of these stunning cliffs — it swings past a scenic overlook. 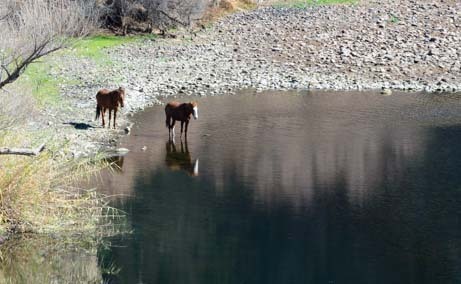 One day we spotted wild horses as we passed this overlook, standing in the water far below. 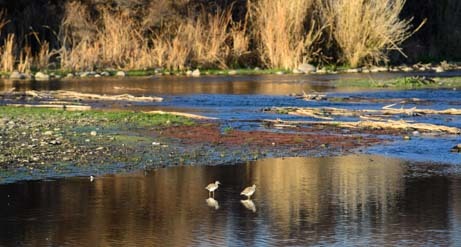 But it is in the late afternoon when this special spot really comes alive. As the sun falls low in the sky, the shimmering rock faces of the cliffs light up in brilliant hues of orange and red while the water at the base mirrors it all in vivid shades. One afternoon, when the lighting at this overlook was just way to beautiful to drive past, we stopped to find a group of photographers hanging out with their tripods all around the water’s edge. We joined right in with the group, savoring this golden hour and wondering what the sunset might bring. The sunset didn’t materialize that night, but Saguaro Lake itself drew us back again the next day to scope out the scenic vistas there. 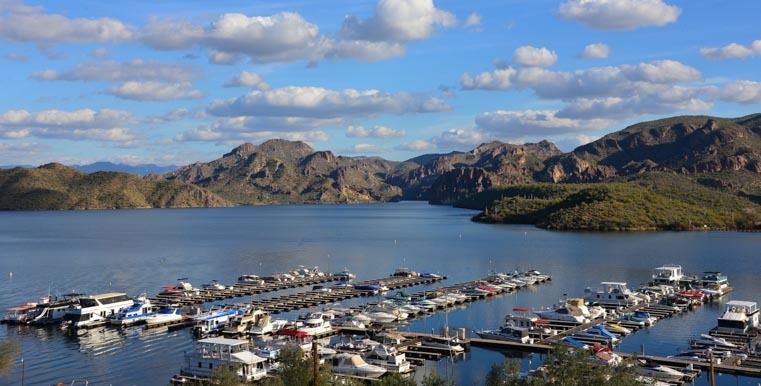 Saguaro Lake Marina — water toys in the desert! What a spot! 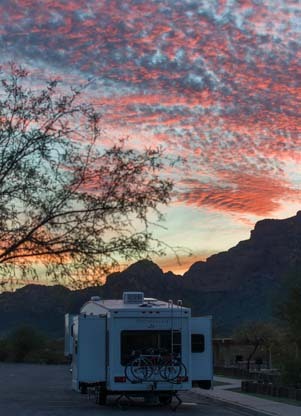 We love all the Phoenix area lakes, but this has to be one of the prettiest. The bright yellow flowers of the brittlebush had just come into full bloom, and the shores were dancing in their golden spray. 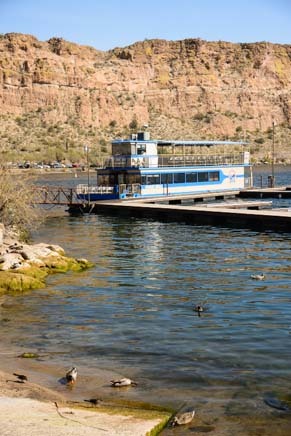 Saguaro Lake was formed by damming up the Salt River. It is wide and lake-like at the dammed end, but it wanders on a snaky, riverlike path upstream. There is a marina in the widest part of the lake, and the boats were shimmering in the noon-time sun. 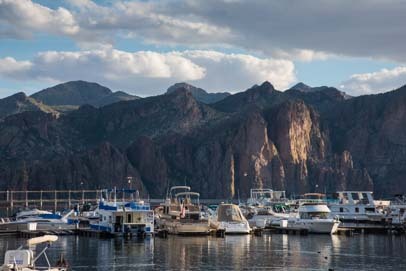 A funny little factoid is that Arizona has the highest number of boats per capita of any state. 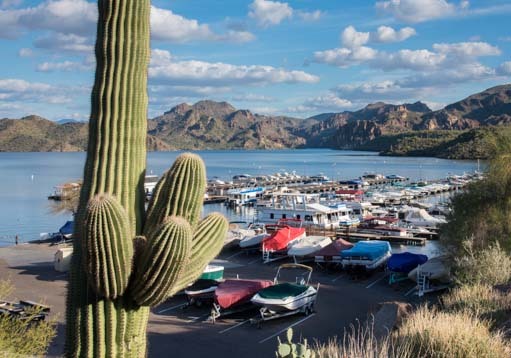 There it is – a saguaro on the lake at Saguaro Lake! This is odd for a state that contains so much desert land, but the low number of citizens in the state — and their very parched nature after they have lived here a while — surely contributes to this unexpected statistic. We wandered along the waterfront, and dined at the wonderful Lakeshore Restaurant where we got seats on the patio overlooking the action on the water. What a great way to while away an afternoon! 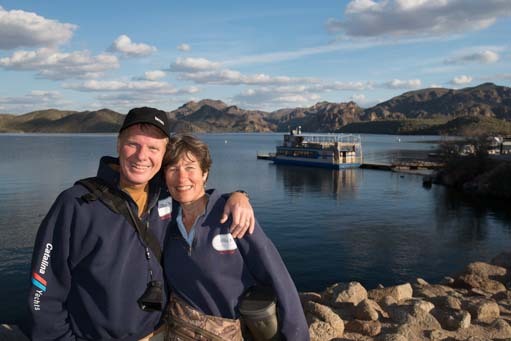 We didn’t take the little excursion paddle boat ride on Desert Belle this time around, but it is a delightful outing we did once, years ago, to celebrate Mark’s birthday. We watched folks eagerly lining up now just as we had done way back when. At the further end of the lake there is a small, gravelly beach where tall, very undesert-like trees grow. This isn’t much of a beach, as beaches go, but it is an intriguing spot in the desert. 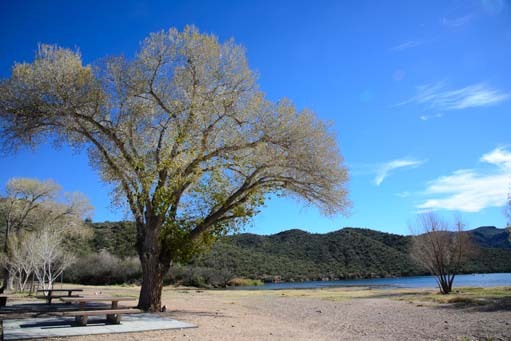 The trees are very large and it is a great spot to launch a kayak to explore the lake and the river upstream. 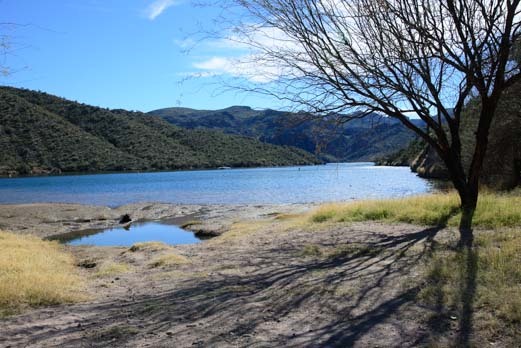 Saguaro Lake has a wonderfully natural feeling to it, even though it is a lake that was made by damming up a river. 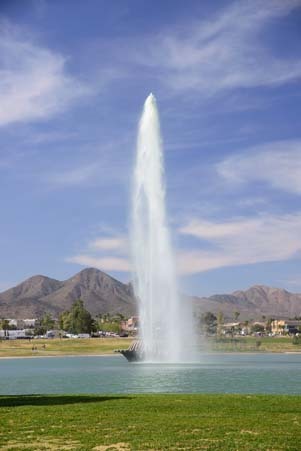 In contrast, the lake in the center of nearby Fountain Hills is totally manmade without the help of a river. It was made by digging a hole, lining it, and filling it with water. At its center there is a fountain that shoots water way up in the air every hour for a few minutes. This lake is an urban lake, with a paved walking path encircling it, and pretty landscaped lawns all around. 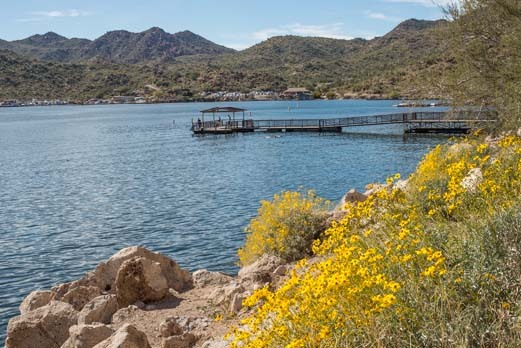 Whereas the desert around Saguaro Lake is natural, and you have to guess what kind of cactus put all those sharp needles into your hiking boots, there is a garden by the Fountain Hills lake where all the desert plants are labeled — and de-thorned. Each lake is lovely in its own way, the one a bit wild and free with towering cliffs for a backdrop and seagulls and powerboats punctuating the scenery, while the other is small and civilized and boasts one of the tallest fountains in the world. 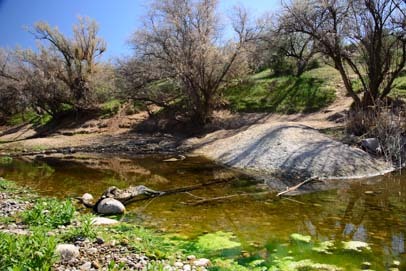 The most intriguing thing about both lakes is that their presence makes it seem like water is plentiful and in total abundance in the middle of the Arizona desert. Water is flung about with carefree abandon, shooting into the sky and supporting a myriad of boating activities. This seemingly endless supply of water may be an illusion, but it is an illusion that is alive and well in Phoenix. Illusion or no, we were enjoying ourselves in this part of Arizona so much that we felt utterly content and felt absolutely no compulsion to go anywhere else. The days ran into each other pell mell, and we basked in the unusually warm weather and even warmer friendships we were forming with other travelers we were meeting everyday. We were busy from morning til night and each day was completely different from the one before it. The more we saw, the more we wanted to see, and do, and experience, before we moved on. So we settled in and relaxed and made the most of this very special and unusually summery winter in Phoenix.